Every Friday morning I attend a seminar for the colonial cities module of my Urban History MA. Last week we were discussing architecture and town planning, how Europeans attempted to impose their ideas of 'rational' and 'scientific' design on their imperial cities. In the Indian context this led to the brief flowering of the Indo-Saracenic architectural style in the late 19th century, a British appropriation of Indian, particularly Islamic Indian, forms for their own purposes. This form of power display, taking possession of the sub-continent's past and presenting the British as part of it, later gave way to to more self-consciously European styles, particularly Victoria Gothic, as the British became more concerned with asserting their otherness from the indigenous population. Debates around architectural designs always emphasised the inferiority of Hindu forms, Muslim buildings were viewed as superior to these and European ideas were (of course!) the height of 'scientific rationality'. The relevance of this to the choice of font for a documentary about contemporary India might not seem immediately obvious. But think about that image a little more. The railway was built by the British to be the envy of the world and to 'modernise' India, enforcing 'rational' western concepts of time and allowing the flow of people and goods, one of the great aims of European town planners. The word RAILWAY in the title appears in the kind of font (roman, serif) commonly used in Britain during the imperial period. Roman fonts (that is, ones with upright letters like the one your are reading, as opposed to italic fonts) have historically been used for serious writings which were worth investing in. Italic fonts took up less space and so were used for cheaper pamphlets. Both have their origins in 15th century Italian handwriting styles: the roman style was favoured by humanist scholars, italic fonts derive from more informal handwriting styles. Since then these forms have become idealised to the point where they bear little resemblance to handwritten letters. The word RAILWAY in the title thus carries this history in its representation: it is serious, monumental, rational. 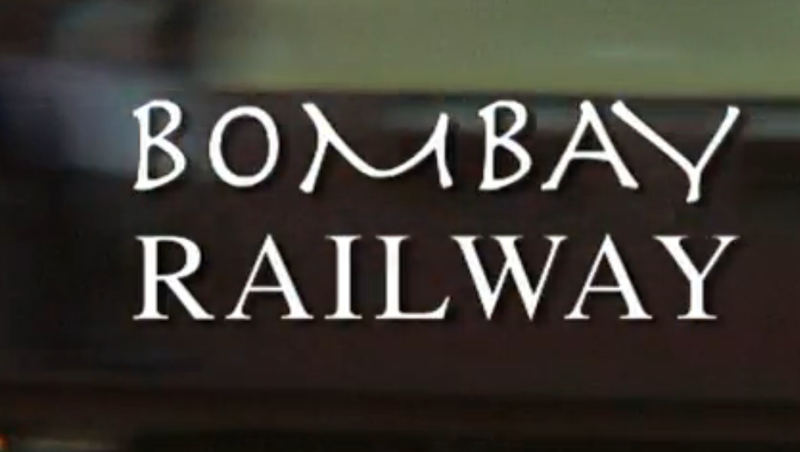 By contrast the word BOMBAY appears in a loose script clearly inspired by handwriting. The curving forms of M and Y perhaps suggest Orientalist ideas of the exotic. Some of the bustling chaos of Bombay is conveyed even in how it is written. Indian typography has it's own rich traditions (which I know far too little about! ), but in this case the designer is simply using type to highlight some of our pre-existing ideas of India: informal, busy, vast (Bombay has fewer letters than railway but is taking up the same amount of space), exciting. This visual contrast between the two words echoes British thinking about India down the centuries, including colonial debates around architecture. The wonderful thing about studying the past in depth is that it heightens my awareness of the world around me. While I might have noticed the contrast in letterforms without having studied the history, I would not have been able to place it in the context of other representations of India. And without a little knowledge of the history of typography, I would not have been able to appreciate the specifics of how this contrast in brought out. I hope this post has sparked some thoughts, and I'd be interested in hearing about things you only notice because of your historical knowledge/training.